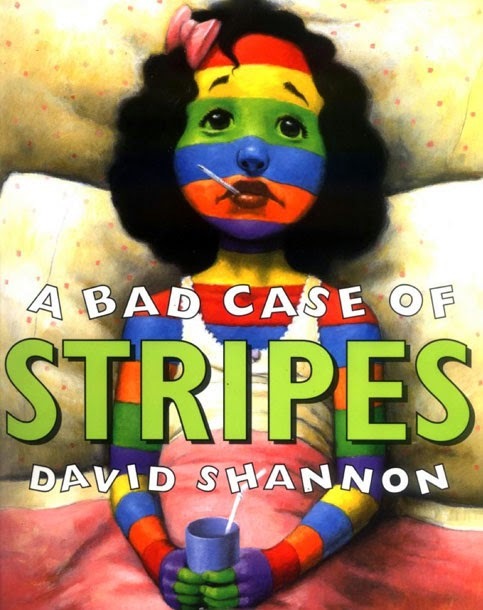 A Bad Case of Stripes is about Camilla Cream, a girl who loves lima beans. Camilla loved lima beans but never ate them because her friends did not like them. All Camilla wants is to fit in and to her, eating lima beans was not the way to fit in with her friends at school. Camilla was so worried about what her friends would think and ends up developing a case of stripes. She is covered in different colored stripes from head to toe and has to go to school with her stripes. When Camilla goes to school, the other children make fun of her stripes. The other children shout out different colors and patterns and watch Camilla's skin change! Her family calls the doctors, specialists, and the experts but no one was able to solve Camilla's case of stripes! Finally, one day, an older woman comes to Camilla's home and offers her lima beans. Camilla thinks about the lima beans and how good they would taste but does not want to admit that she loved them... until the old woman turns to walk away. Camilla quickly tells the old woman that she loves lima beans and she ate all of them that the old woman offered her. Suddenly Camilla's stripes were gone! After her bad case of stripes, Camilla did not worry about who saw her eating lima beans anymore. She learned to accept herself and how much she loved lima beans. A Bad Case of Stripes is a great example of self-love and knowledge because Camilla is a little girl who has a fear of not fitting in. This is something many children go through when they are in school. Children need to learn how to love themselves for who they are and what they like. It is important for children to learn this early on so that they are more comfortable in their skin. Camilla learns that her love for lima beans is a part of who she is and in the end is comfortable eating them in front of anyone. Camilla learns this lesson with a case of stripes and starts to understand how it feels to be different. When she finally admits to liking lima beans is when she returns to her non-striped self. Once children learn to love and respect themselves then they are able to have respect for others. This book would be good to introduce to a second grade classroom in the beginning of the school year. This book can be used to teach students to accept themselves and loves themselves while teaching them to embrace each other's similarities and differences. An activity I found through Scholastic is to read the book with your students and then have them draw a picture of themselves. The picture should be titled, "A Bad Case of..." Have the students decorate the picture with something that they really enjoy or that they love. This is a good way to get the students to know one another during the first days of school and get them to understand what one another enjoys.